PORTLAND, 1964 and 1965: Mayor Terry Schrunk declared war on bars frequented by gays and lesbians following a period where the city and police allowed these establishments to operate without attempts to close them. This allowance, however, was only in order to surveil and contain them, said Peter Boag, an author, historian and Washington State University professor. At the time, newspaper headlines were splashed with coverage of alleged “homosexual rings” of pedophiles, which fed into widespread public panic that gay men were threats to traditional family values and children, according to a 2004 Oregon Historical Quarterly essay by Boag. Schrunk pressured the Oregon Liquor Control Commission to deny liquor licenses to six establishments known for “heavy homosexual patronage,” according to Boag’s essay. The OLCC, however, found the six businesses to be breaking no laws and renewed their licenses. It was just two years later, in 1967, that Walter Cole bought Demas Tavern in the heart of Old Town. He hired a lesbian bartender and turned Demas into a lesbian bar, the only bar in the neighborhood to cater to anyone in the LGBTQ+ community. In 1969, Cole left his wife of 18 years and came out as a gay man. Now, his drag persona, Darcelle XV, is internationally known, as are the shows put on by Darcelle XV Showplace, formerly Demas Tavern. Since then, the landscape of Old Town has changed drastically. In 1970, the Portland Gay Liberation Front kicked off the broader LGBTQ+ rights movement. In the 1980s and 1990s, Stark Street – now Harvey Milk Street – was the closest thing to a gay district Portland has ever had. “Every bar was a queer bar, the hub was down there,” said Belinda Carroll, a comedian and cofounder of the Portland Queer Comedy Festival. Carroll came out in Portland at age 15, in the early 1990s. The 1980s and 1990s also saw several anti-gay ballot measures, including Measure 9, which attempted to amend the Oregon Constitution to ban civil rights protection based on sexual orientation. Today, what was once the “queer hub” in Old Town is reduced to only a few gay bars and clubs. 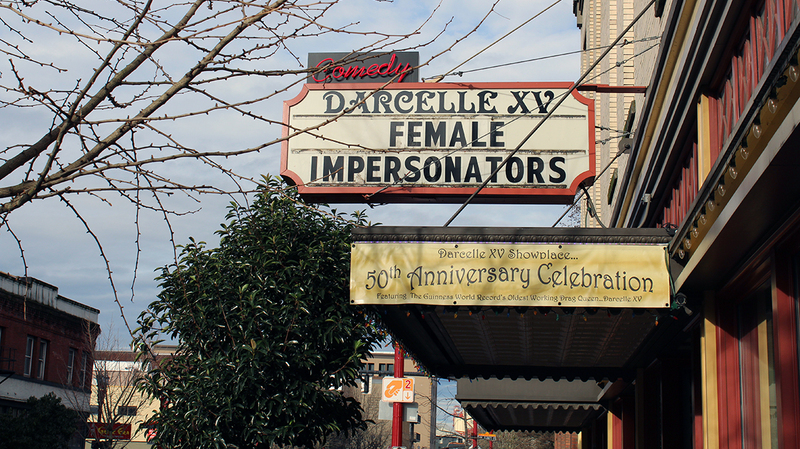 Through it all, Darcelle XV Showplace has grown and thrived in Old Town, and is now the longest running drag show on the West Coast. Cole, who was born in 1930, has been recognized by the Guinness World Records as the oldest drag queen in the world. Street Roots recently chatted with him about how LGBTQ+ culture in the Old Town neighborhood has changed through the years. 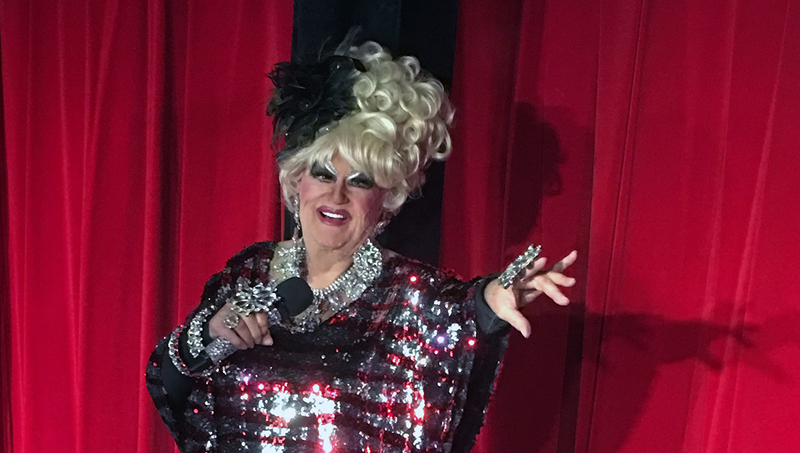 Sarah Hansell: Since you’ve been part of the LGBTQ+ community in Old Town for so long, I wanted to talk to you about your experiences in that neighborhood and about the LGBTQ+ culture in that neighborhood — what you’ve been a part of and what Darcelle XV Showplace has been a part of through the years. Walter Cole: Well, I bought Demas Tavern in 1967, 51 years ago now. It was Skid Row then. It wasn’t Old Town. It wasn’t homeless; it was winos. We’ve had our share. But they were not a problem, because by 8 o’clock in the morning, they’ve already had all they can handle and are on their way. Then we went through the druggie time, with the drug dealers. None of my gay friends would come across Burnside because it was Skid Row; they were afraid. I hired a lesbian bartender, and we were a lesbian bar for about five years. Thank goodness those ladies helped me keep the place open. And during that time, we started the shows to entertain them. Darcelle XV Showplace was originally Demas Tavern. Walter Cole turned it into a lesbian bar after buying it in the 1960s. It was the only bar in Old Town catering to LGBTQ+ patrons. S.H. : When you came into Old Town, were there any other businesses or organizations for LGBTQ+ folks? W.C.: Not then, not in our area. Later on, there was a bar across from the Republic, called the Magic Garden, and it was a lesbian bar also. But pretty soon, when the word got out by Willamette Week, a freelance author wrote a story about us in the Willamette Week, about 1982 or so, our doors opened to the public. And from then on, it’s been up and down, up and down and all around. And then next door was a Greek restaurant for a while, and then CC Slaughter’s moved in, which is a gay bar. And we have Hobo’s, which is also a mixture bar but run by gays. Thank goodness we were all right there; I was by myself for years. But it wasn’t a bad time – we didn’t have any problems down there. No problems with the city. We just operated our bar. We were a tavern at the time. S.H. : So did you do drag shows from the very beginning? W.C.: Pretty close to the beginning. I had to have some business, so we brought the lesbians in, and we put the shows on for them. And we started on a 4 by 8 banquet table for the stage. And nobody fell off – we never fell off. Our only lighting was a slide projector. You probably don’t even know what those are; they were way back when. And if you tipped them, the light bulb would go out. So if anybody was operating it — we didn’t have an operator, just whoever was in the tavern would shine it at us — would tip it, it would go out and I’d go, “Please be careful!” and out we’d go with no lighting. Course that’s different now. We’re a full-fledged cabaret with sound equipment, computerized music and the whole thing. It’s evolved over the years; it wasn’t right away. S.H. : You were part of the Old Town community since the late 1960s; what was the LGBTQ+ culture like in that neighborhood? Were people more open about their sexuality? W.C.: No, no, you’re talking about ’67, my dear. We didn’t walk out the door in drag. We stayed inside. We got ready inside and walked out in Levis. No, no, it wasn’t the area; it was the feeling of everywhere, not just where we were. There were gay bashings, there were all sorts of things happening, and we of course did not want to get hurt. We were pretty cautious until that article was out. And then, still, we didn’t walk in the streets; we didn’t go from club to club. We were in the club, and that was it. Now, of course, everything’s changed beautifully. We’re accepted everywhere and involved with everything in the community, everything. Major corporations want drag queens to do their parties, and on and on and on. S.H. : Was there anything that made Old Town different than other parts of Portland in terms of LGBTQ+ culture? W.C.: In the ’80s and ’90s, it was all on Stark Street. There were about 10 bars. We’re down to about three now. But that’s because we can go anywhere. We don’t have to have our own bars and close the door and don’t want anybody in except us. That’s over with now; we can go anywhere in town. And our community continues to flourish. We just got through coronation. We’ve had 60 empresses and emperors (with the Imperial Sovereign Rose Court). We raised thousands of dollars during the AIDS crisis to help our friends that were ill, and now most of the money that we raise goes to scholarships. We’ve still got a very active community. I think that it wasn’t just our community that made it happen; I think it was a mixture of everything, and like I said, we’re welcome everywhere now. There’s no way to pin down, “well this happened, then that was the reaction.” We took care of ourselves, We took care of our friends that were ill those days from that horrible plague. We always fought for those civil rights, our rights, and we’ve got them now. But we’ve got to hold on to them.